These dogs are everything that you could ever want in a pet. We absolutely adore Sadie and seriously couldn’t ask for a better dog. She is sweet, patient, relaxed, fun, great with other dogs, and wonderful with the kids—absolutely everything you could want! She’s my constant companion, but she’s happiest and most relaxed when the whole family is together. She goes everywhere with us and people stop us all the time to ask about her. They usually tell us that she’s the perfect size (true!) or the perfect color (also true!) or just so sweet (totally true!). She’s really smart, which is super fun for the kids because they have been teaching her all kinds of cool tricks and she catches on right away. We feel so lucky to have her in our lives! 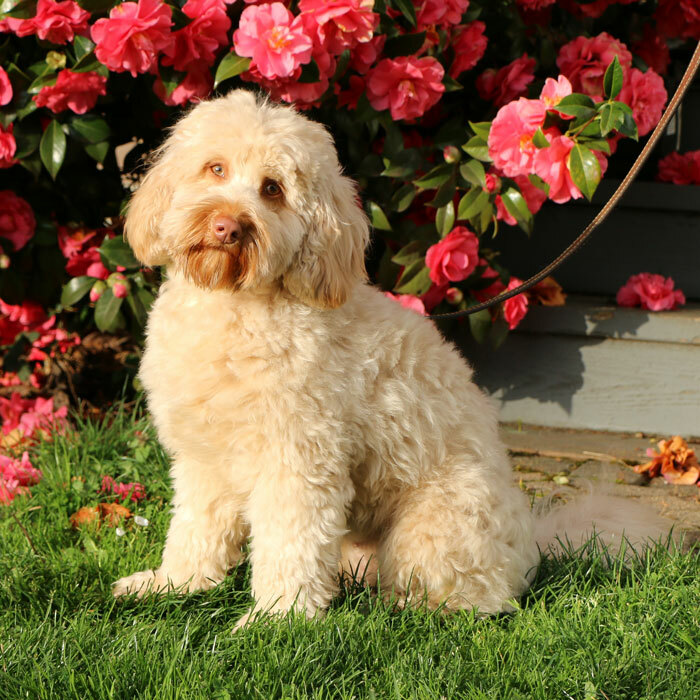 All of us, the Lindgrens and our Guardians, are dedicated to raising these dogs in real life settings knowing with pride that we are all taking a part in bringing beautiful Labradoodle puppies to you! Ziva is a great small/medium sized girl that lives in a Guardian home in Portland. We look forward to seeing her puppies! Moppet is a lover. She is curious about other dogs, and will happily greet them, but its humans she prefers to lavish with her love and attention. Her best friend is a cat named Thomas, they grew up together and playfully romp and wrestle in the house and yard…other cats are a bit wary as her exuberance can be overwhelming. 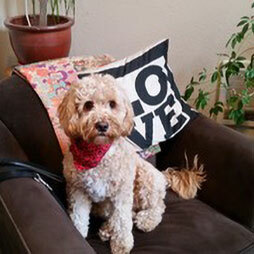 Moppet has mastered all basic obedience commands…she is smart and can anticipate what her humans are going to ask for. She loves children and adults alike…chasing games are her favorite, and she offers up kisses to anyone who extends a body part. We are in training to become a therapy dog team. Moppet is not aggressive, and her precocious behavior is easily controlled. She’s not timid, loves hiking in the woods…well just about anywhere, and uses her nose to find out what’s around now, what’s been here, and where it might have gone. I’ve never owned such a loyal dog, she will wander off and out of sight briefly, and when she can’t see her humans, she hustles back to make sure they are okay without her. Without much effort, I was able to train her to return to me when called using voice and arm gestures…she’s a super pet, attentive protector, and all around great companion. This is truly a family business because each person is involved with these dogs. We love our Standard sized dogs. They are such nice family dogs and who doesn't love the presence of a big dog greeting guests at the door! Pearl is a big sweetie. She loves her family and it is really fun to watch her when she reunites with them after having been with us for a week. She is great with other dogs and she as a super soft coat! Here is what our Guardian family thinks about Pearl: Pearl brings such JOY to our family! It's hard to resist her soft "pearl colored" fleece, black button nose and expressive brown eyes. She's fun, smart, cautious, loving and a little feisty at times. One of her favorite games to play is what we call "steal the slipper". We think she enjoys getting caught with the stolen slipper the most, so we can chase her around the house trying to get it back. So funny! Pearl loves her daily walks, playing ball, car rides, chasing squirrels/birds and just hanging out with the family. 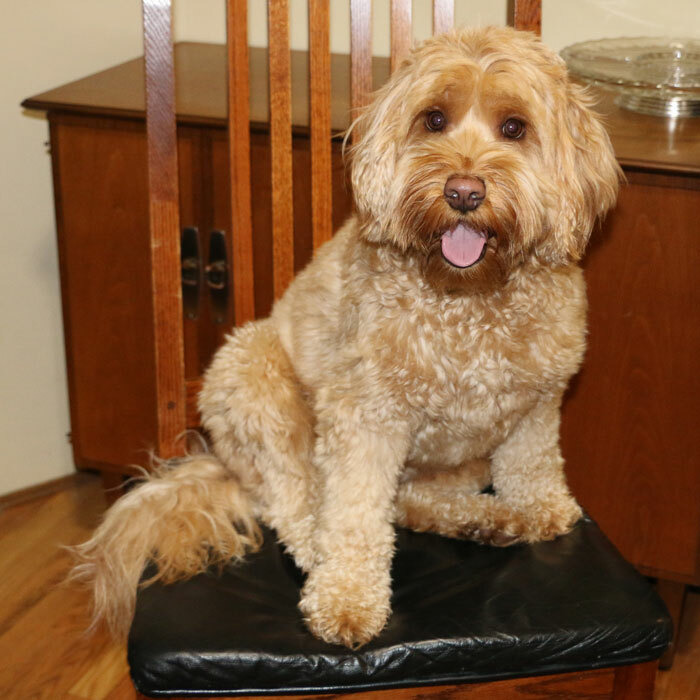 We are so blessed to have heard of Signature Labradoodles and their guardian program. Dale and Amy are very knowledgable and easy to talk to. They are always available to answer questions or concerns. It's very exciting to think Pearl will be a mama soon. We know she'll do great and produce some darn cute puppies. 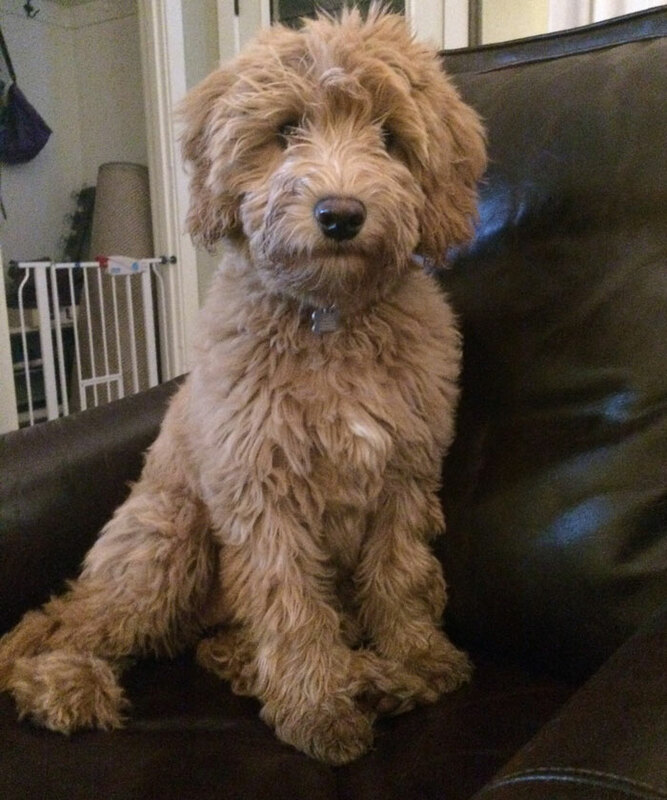 If you're considering bringing a labradoodle into your family......DO IT! You won't regret it. It'll change your life in the best of ways. Each of our children helps to feed, brush, clean, and most importantly play with "their" dogs. 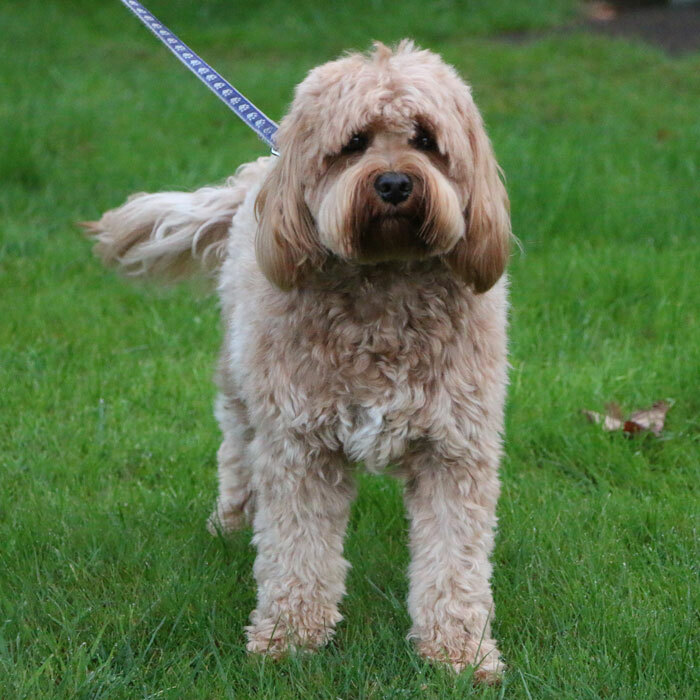 Over the last year my family has been given the wonderful opportunity to be guardians for two very special labradoodles, Buttercup and Charli. The two pups quickly became best friends, and found a special place in my family's hearts. They have such a amazing personality, both very playful and so smart. They are great with the kids and our cat, which as a cat owner you are always a little worried if they will be ok with dogs in the house. I was thrilled once they started to play with each other! My favorite time is in the evening when we finally get to all sit down and catch a show. They snuggle up in you lap and will rest their head on your chest. Buttercup and Charli travel well because of their smaller size. They can both fit in a crate in back of the car and they love going on adventures. For my active family this is the perfect breed. 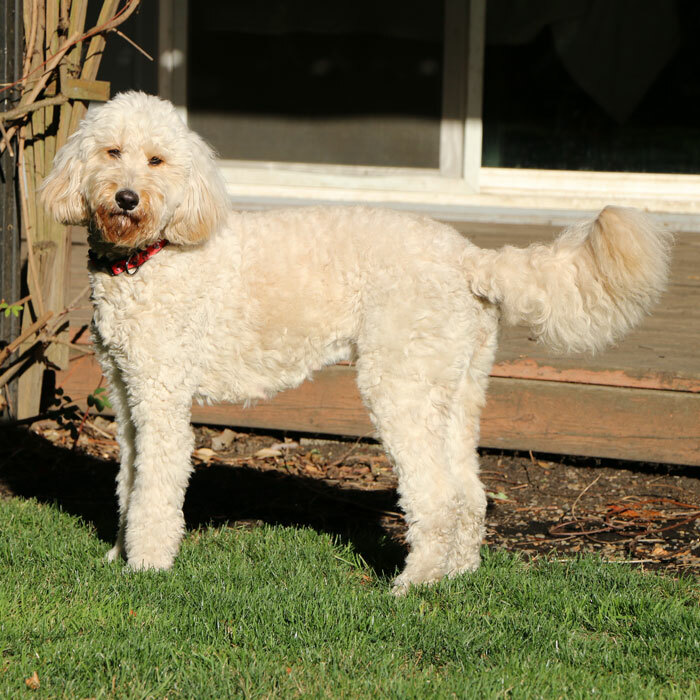 Our breeding dogs are all tested to at the very least the "Silver Paw" standards... the high testing standards of the Australian Labradoodle Association of America. There is a lot to love about Bailey!! 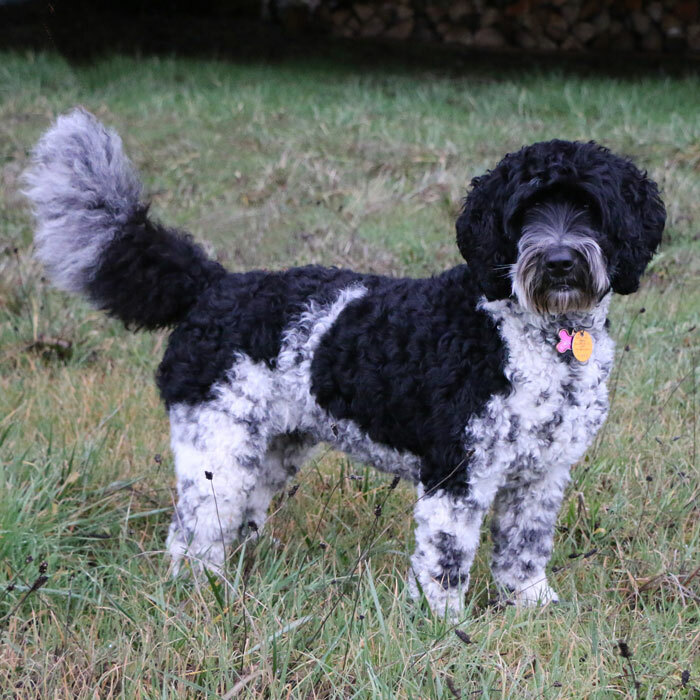 From her gorgeous black and white coloring to her sweet personality and calm demeanor, she has been the perfect addition to our family! Her favorite things are her people (especially our two girls), walks, belly rubs and playing with other dogs. If she is really happy (usually while getting a belly rub), she will even smile for you! Our two girls have taught her to high five, a trick they love to show off to everyone. Bailey does have a mischievous side and loves to get socks forcing us to chase her for a game of keep away. But, overall she is just such a sweet girl who has added so much fun to our family. Living with our wonderful Guardian home families gives our dogs a permanent home. They visit us from time to time and when they have their litters. We are first-time dog owners and honestly we were a little nervous about having a dog with our busy family. Sugar has been an amazing addition to our family. She is delightful. She is well tempered and has adapted to her environment. Dale and Amy helped us to get set-up and have provided support to make us successful dog owners. 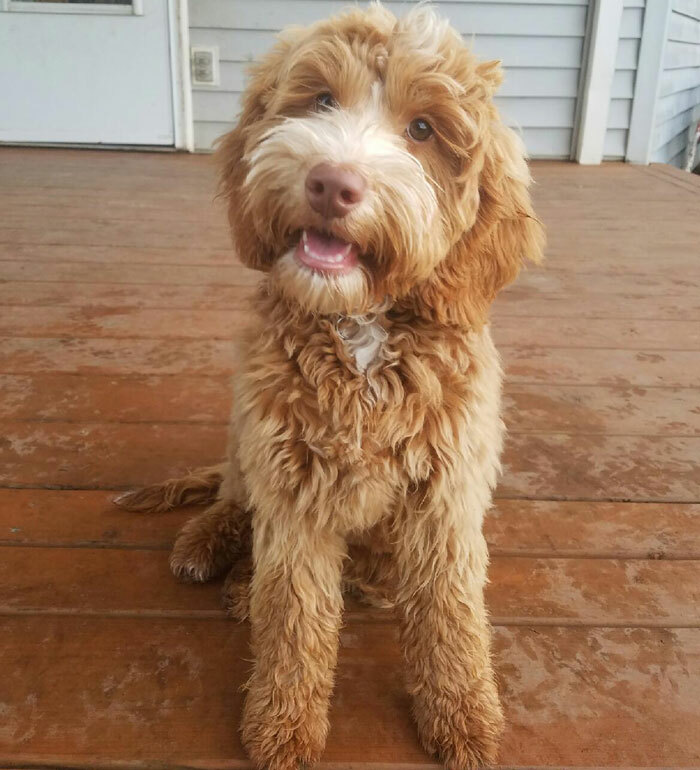 We highly recommend Signature Labradoodles. We wanted to give you a quick update and let you know that the puppy is adjusting to us very well. She was very curious about our house and everyone in it. So she followed us around everywhere we went and was sniffing away. She even played a game of chase with the kiddos around our kitchen island. She loved it! So did the kiddos. We decided to name her Mabel as it means beautiful, loving and lovable....everything she is. It also stands for "Mothers Always Bring Extra Love". Since she will be a mother one day, the name seemed perfect for her. A home is not complete without a dog and we definitely feel that Mabel has brought much love and happiness to our family. Mabel is lively, energetic yet sweet and gentle. She plays with our three children, ages 3, 6 and 11. At times it is difficult to determine who is entertaining who more as all of them enjoy chase, digging in the dirt and playing ball. We did not expect this, but Mabel is very protective of the children and will alert us with her mighty bark if she feels they are in danger. We are grateful for her natural instincts. Mabel is our family greeter for anyone who visits. No one gets by without a kiss. Her sunny disposition receives a lot of attention from family and friends who admire her sweetness as well as her beautiful color and soft coat. Mabel enjoys going for walks rain or shine and her size makes it really easy for the older children to handle her. 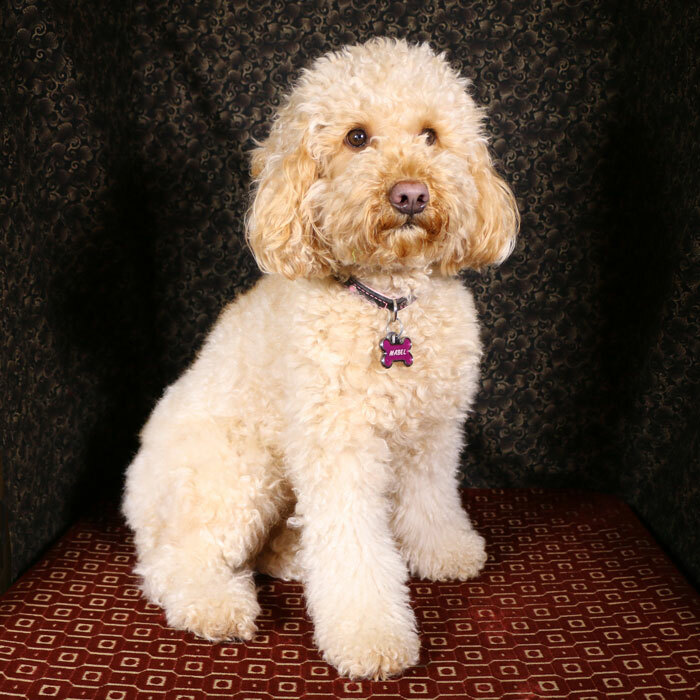 While Mabel loves being outdoors and going for a walk, her favorite past time is sneaking up on the coach under a blanket to cuddle with the children as they watch a movie. This is our first experience as a Guardian family. We were excited and nervous at the same time as we did not know what to expect. Along the way we have had questions come up and reached out to Dale and Amy. No matter how big or small our question was they have been available to help us. We have had such a wonderful experience we have shared our adventure with others and encouraged them to learn more about the program to see if it would be a good fit. We would definitely participate as a Guardian family again. Thank you Amy and Dale for bringing Lulu into our lives! Lulu is an such amazing dog! We get comments on her where ever we go. Even friends who aren't "dog people" can't resist her sweet and loving personality. She's a wonderful addition to our family. Our two girls adore her and love playing and getting loves from her. She even goes to check on them when they are upset. Lulu loves playing with our little cat, Gatsby, and loves, loves, loves playing with other dogs. She has a best doggy friend who lives across the street who she looks forward to playing with often. One of my favorite "Lulu" things she does is she loves carrying around the girls' socks, yet she so gentle with them that she's never put a hole in any of them! She's super smart, too! She even learned to ring a bell when she needs to go outside to go potty, and has taught our kitty to ring the bell, too! She's super chill most of the time, but also loves to play... The best of both worlds! Thanks for bringing her into our lives!! Our dogs love to be around "their" humans. They are very social, sometimes even enjoying watching a movie with you... full attention on what is happening on the screen! 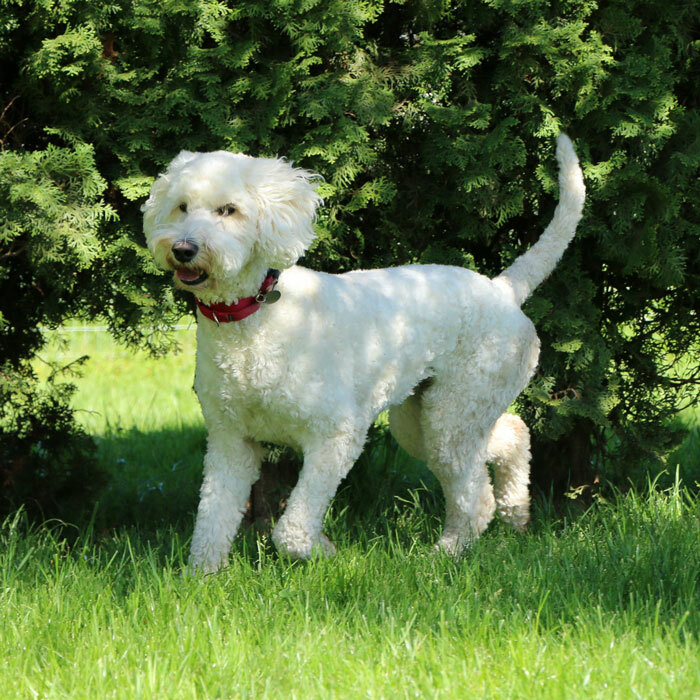 Ruffles is a playful, exuberant and gentle dog. She is very loving and loves to lick our faces and cuddle up on the couch. We also have an older dog, and Ruffles loves to play with him too! 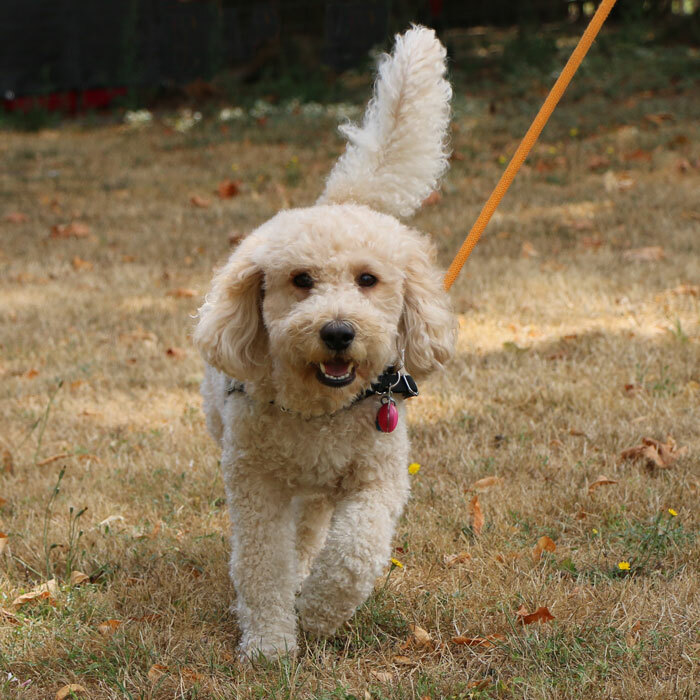 Ruffles loves her walks, people and to play fetch. She often makes us laugh, like when she is chasing her tail or watching a bird fly overhead. We find so much enjoyment in her. We're also very grateful for Amy and Dale. They have always been very responsive to any question we've had. Do you ever look at your dog and think... How did I get so lucky? 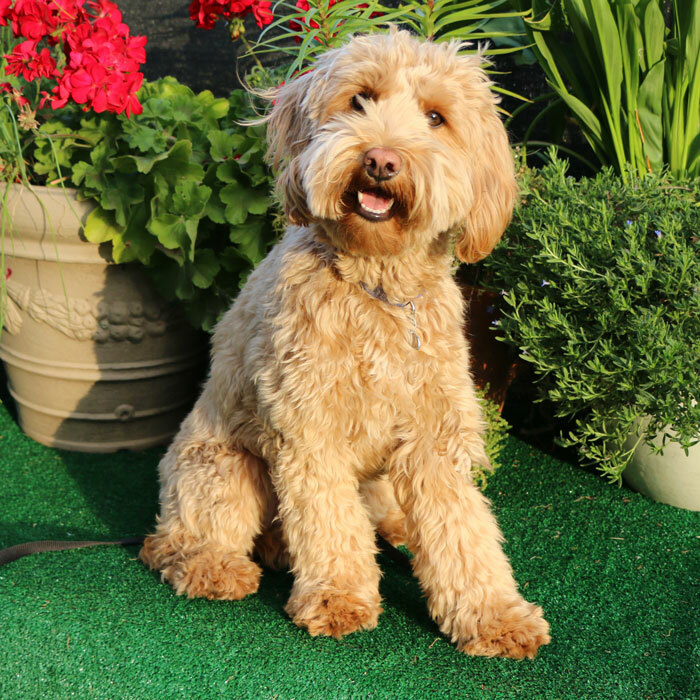 We love our Labradoodles and consider ourselves lucky to have found this breed and honored to share them with you! Piper is so wonderful! She loves hanging out at our gym and greeting everybody that walks in. She likes to lay outside my office door so she doesn't miss anything. She is so sweet and smart. She seems to know when it is time to lay down and be calm and when it is OK to play. She loves to prance around and make sure everyone is doing what they are supposed to during Pilates class. When we get home she is so excited to play with our other dog, Tonka. They became fast friends and love to run all over the yard together. She loves any toy that squeeks! She is so funny and makes us laugh. She has little bursts of energy, like most puppies, and we have nicknamed her "Hyper Piper" during these moments. My kids can't wait to get home after school so they can be greeted by Piper. She acts like she hasn't seen them for so long and practically jumps into their arms. She has the best personality and is so loving. She seems to have a special connection with each of us all our own. I just could go on and on telling you how much we love and adore our Piper girl! Thank you so much for bringing her into our family! 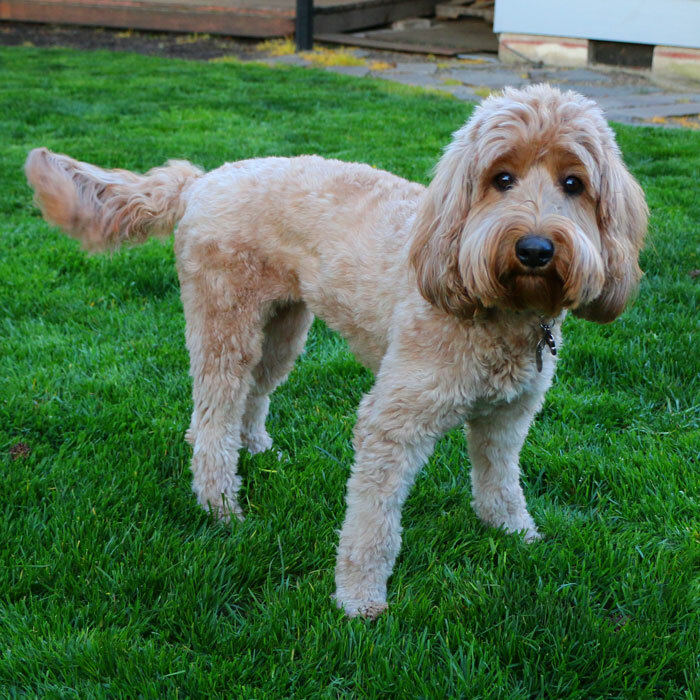 Labradoodles can make great service dogs. All the efforts you put into training your dog comes back to you ten-fold! They are loved on by all of our children and all of our fantastic Guardian Families. Jasmine is a great companion. My first experience at having a dog in my life has been exceptional because of her. She is such a sweet, smart, social and lovable dog. Jasmine has no enemies. She greets all dogs and humans as if they were her long lost friend. I have many people coming to my house for both work and personally. Everyone who comes to the house thinks that they are Jasmine’s favorite, because of all the love and attention she showers on them. She is particularly sensitive to people who are hurting or in pain…giving them a little extra love. She is so gentle with people and small puppies. We go everywhere together. She is my constant companion. We regularly hike or take walks. She has even been paddling in a canoe with her own life jacket. I have an active lifestyle and she has been an addition to that, seeming up for anything. If the weather is not too warm or too cold, she travels with me during the day in the car. I will go to my meetings and she will be quite content to be in the car with a chew or a “baby”. Rarely do we go for a walk when someone doesn’t stop to say how “cute” she is or what a well behaved dog she is. They love her size, her temperament and look. She has accumulated many admirers in her time with me. She is way more social than I, so she gets me out and meeting new people. 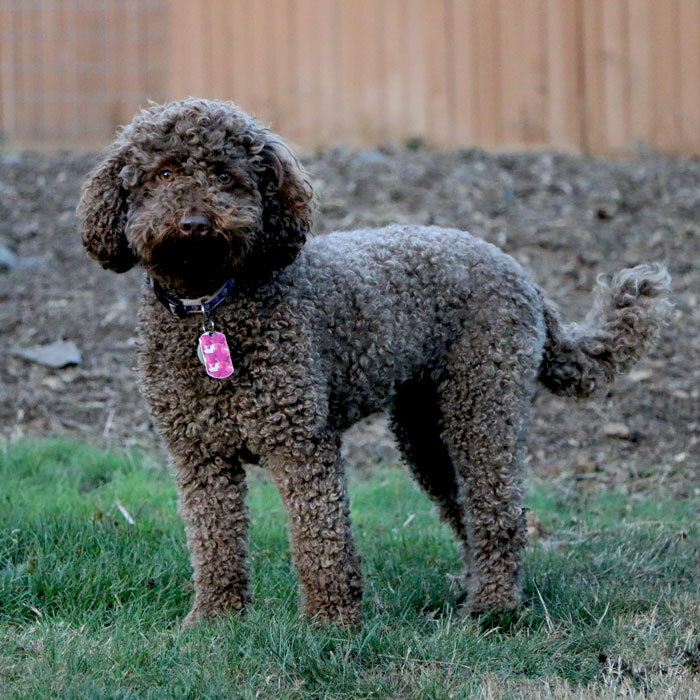 Since this is my first experience with a dog, it is my first experience with a labradoodle. Jasmine and I have met others in our travels. Every dog and their companion we meet loves the breed. I am a lover of the breed as well. I have loved working with the Lindgren’s. They are such good people. I appreciate their approach to raising dogs and am so fortunate to be part of the guardian program. We do not EVER kennel our dogs. If they are not living with us, they live with our wonderful Guardian home families. 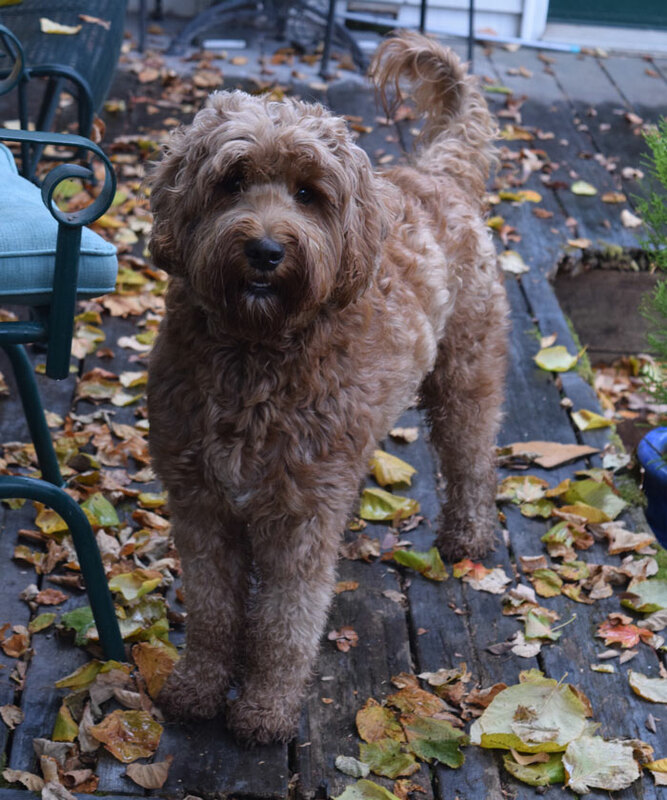 Over the last year my family has been given the wonderful opportunity to be guardians for two very special labradoodles, Buttercup and Charli. The two pups quickly became best friends, and found a special place in my family's hearts. They have such a amazing personality, both very playful and so smart. They are great with the kids and our cat, which as a cat owner you are always a little worried if they will be ok with dogs in the house. I was thrilled once they started to play with each other! My favorite time is in the evening when we finally get to all sit down and catch a show. They snuggle up in you lap and will rest their head on your chest. Buttercup and Charli travel well because of their smaller size. They can both fit in a crate in back of the car and they love going on adventures. For my active family this is the perfect breed. We have had the pleasure of being a guardian family to Nut”Meg” for the last two and half years. Meg has the most loving and happy disposition. We brought her in to be a companion to our elderly Labrador Lucy, and Meg has taken that role very seriously. She communicates well what she or Lucy needs, she learns very quickly and is sharp as tack. She enjoys her new kitty, Remy, and has 8 chickens in her grandpa’s field… Meg loves to run really fast, ZOOM the chickens, take walks with her sissy Lucy and watch TV and snuggle at night with us. Her favorite show is anything with dogs or pet commercials… Our little "Meg-A-Loo" is a great companion with an absolutely beautiful personality and a real social butterfly! wonderful addition to our household. 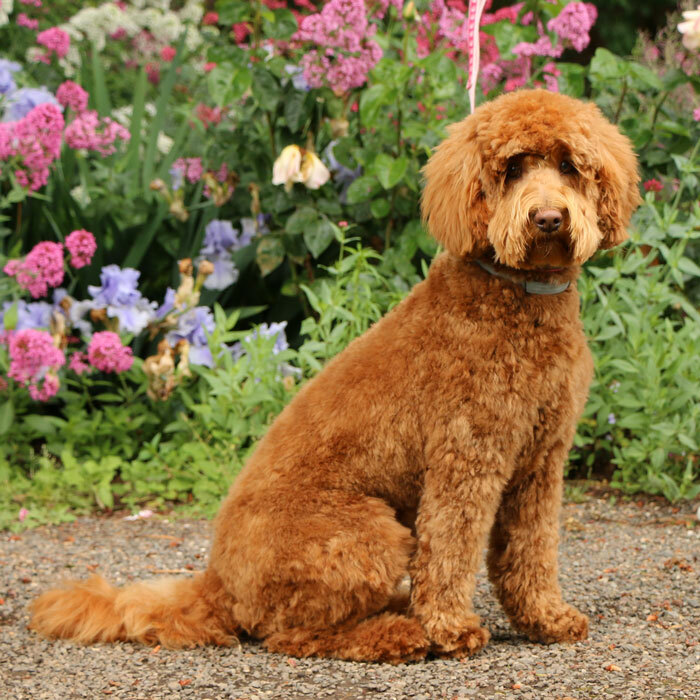 They are well-mannered, intelligent pets and at the same time they integral participants in our Labradoodle business. Remy lives with her guardian home in Portland Oregon. She is a sweet girl that loves the couch potato type of life! She is a lover, cuddler, and extremely loyal.